The label “ambient electronica” is a strange one – one that can really mean a lot of things. I guess, to me, it means the sort of music that is made with electronic components, but doesn’t necessarily make you want to dance. And though this EP didn’t have me on my feet, it definitely had my head bobbing along subconsciously. 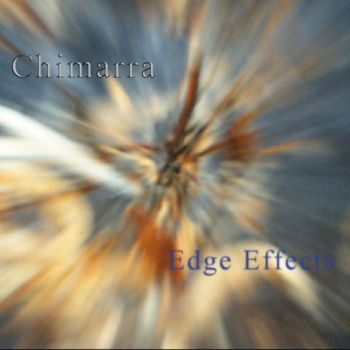 Chimarra’s first EP, Edge Effects, is a 23-minute collection, made up of glitchy drum beats, samples panned to either side of the head, a slew of different synth sounds, and the mellow tone of a euphonium. At first listen, the album is a lot what you’d expect from an ambient electronic artist – the drum beats, especially, remind me of the fizzy rhythms that made up much of Sufjan Steven’s Age of Adz. There are two major things, though, that give this music a different feeling than most other music in this genre: the feeling of a narrative and followable line of song development, and the euphonium. Taking a look at Chimarra’s Facebook page, he lists “the power and beauty of the natural world” as the inspiration for his music – when taking this into account, it makes it a little easier to understand the feeling of calm narration that much of the music has. The choice to include the sounds of a brass instrument – thrown in selectively on euphonium, rather than a sampled sound on a keyboard – is definitely interesting, and it gives the music some really nice dissonance and color. The album definitely rides the line into trance music – it’s pretty meditative and it conveys its ties to the tranquility of nature very well. Tracks I Liked: Cave Patterns!! !, North of the Light!, Timestream! !